Arizer Air II Vaporizer • Evertree • Ireland's Herbal Vape Shop! Say hello to the Arizer Air II, an upgraded version of Arizer’s wildly successful Air vaporizer. The new iteration gives you a 50% higher capacity battery and faster heating, coupled with all of the features that made the original Arizer Air a landmark vape. Providing a “true vaporization” experience through an isolated airpath and kit of glass aroma tubes, Arizer Air II gives you enhanced flavor and vapor purity. Compact and ready to use anywhere, the glass tubes feature a rubber cap so you can pre-load your herb before starting whatever you have to do that day. With precision temp control, the Air II gives you the power to zero in on your perfect vaporizing temperature depending on the type of strain and vapor profile you’re aiming for. With a 2-year warranty the Arizer Air II gives you peace of mind while incorporating the highest quality components, ease-of-use, and heating to launch you higher than ever before. The Arizer Air II is designed with an isolated airpath so the vapor never comes in contact with the electronics housed inside the unit itself, enhancing the purity of your herb’s vapor. The provided glass stem is made with medical-grade borosilicate glass and extends the vapor pathway, which cools down hits and preserves their essential flavors and aromas. Included with the Arizer Air II is a quiver of premium glass components, which include 2 aroma tubes and a botanical dish. These accessories are simple to clean and use, and offer a true vape experience that can be hard to find with a portable vaporizer. Over the years Arizer vaporizers have forged a reputation for providing great vapor, and the Arizer Air II keeps that tradition alive. With a combination of glass, ceramic, and stainless steel making up the vapor path there are no “off flavors” or sections that won’t clean properly or change the taste of your herb from lingering build up. Add in the duo of conduction and convection heating and you’re able to boost your herbs flavors making each taste of vapor extremely pure. A large majority of portable vaporizers offer either conduction OR convection heating, leaving you to weigh the pros and cons of each and hoping you made the right decision. Vaporizers that use the convection method are great for dry herbs, as this style of heating won’t combust the material. A convection unit evenly heats each mouthful of vapor as you pull, which helps each hits flavor and potency. Convection heating is the best way to preserve terpenes (the oils that give your herb their flavor) and your stash, as a small amount can go a long way with convection heating. Conduction heating means the heat source is in direct contact with your herbs, meaning they heat up very fast. This style of heating means the material in contact with the heating element will heat faster than the rest of the herb, so a stir between pulls is necessary to get steady flavorful pulls. Most “beginner” vaporizers utilize this style of heating, as it does not have a steep learning curve. The Arizer Air II combines these heating styles and uses the best qualities of each one. The glass stem heats up at the bottom of the Air II, delivering heat through the oven consistently, while the warm air moving through your herb reaches every area inside the chamber, eliminating the need for stirring. Arizer boosted the heating element on the Air II which loosens the bottleneck and lets you easily deep draw tasty clouds or take slow, flavor rich sips. The Arizer Air II uses a ceramic heating element, which is the best surface to keep the terpenes and subtle flavors of your herb as strong as possible. 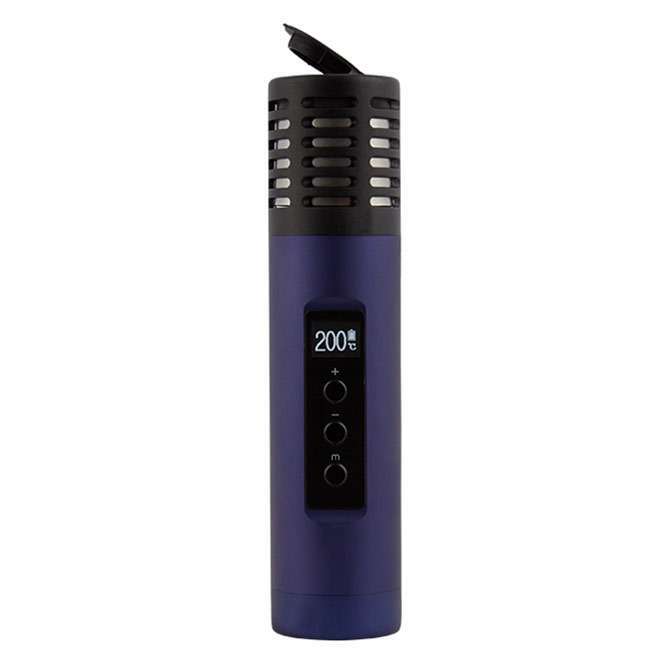 With a revamped easy-to-use LED display the Arizer II gives you the power to control every aspect of your dry herb vaping session, so say goodbye to the guessing game that can come with the “brightly colored lights” method of temperature changing. The LED screen shows temperature, which ranges from 122°F to 428°F, in one or ten degree increments and battery life. This unit also lets you set the auto-shutoff timer, reminder tone volume, display brightness, and length of the button press to turn the vaporizer on. While all of those options may look daunting back to back the Arizer Air II’s screen and simple plus-minus button control easily break down your options and doesn’t need an app, or a giant manual, to operate. Equipped with a convenient and stylish belt clip carrying case the Arizer Air II is ready to go wherever and whenever. The provided case holds the vaporizer, an extra battery, and your glass aroma tube. Arizer made this vape both portable, and powerful, so you can enjoy the flawless, most flavorful vapor on-the-go with no hassles. The rapid heat up time is excellent for vaping on-the-fly when you don’t have much time, and the USB charging makes it simple to power up from your car or computer. For dry herb enthusiasts who want the vapor quality of a desktop vape, but don’t want to deal with the size issues those bring, the Arizer Air II is excellent. The newly designed 18650 battery for the Arizer Air II lasts 50% longer than its predecessor, and is able to heat up faster than the original model. With the new battery design the Air II delivers a solid 75 minutes of continuous vaping from one charge. The new battery is also interchangeable, so if you’ve missed a charging session you can put in a fresh backup (sold separately) without stalling your vaporizing experience. Charge the Arizer Air II up through a USB using the provided cable and power adaptor to enjoy a longer battery life. An added bonus of the Air II is its “pass through” capability, which means you can vape while the unit is charging. The battery now features precision temperature control so you can nail down whatever temp fits your vaping style or strain. The Arizer Air II’s beefed up battery shines through boosted vapor production, convenience, and user experience. Once your Arizer Air II arrives, make sure to fully charge the battery to ensure your first vape session is a good one. After your unit is charged you‘ll want to sterilize it, while this sounds like it might require cleaning supplies don’t worry, Arizer has made this a very easy process. Simply hold down the M button and minus arrow button at the same time to turn the unit on. The bright display will show you a countdown that starts at 5, the numbers should begin to count down after that. When the counter reaches zero, the device will beep and will greet you with a “Hi” message and friendly smiley face. Now that your Air II is unlocked use the up arrow to bring the unit to its highest temperature, which is 428°. This vape will automatically begin to heat, so let it sit and run through a full cycle; after 10 minutes the unit will go into sleep mode. Repeat this process two more times to complete sterilization, this is just to get rid of any of the manufacturing oils that may have gotten inside the unit as a result of putting it together. Once this process is finished you’re ready to load your dry herb. After you’ve ground your herb to a thin consistency, pack it into the dish of your glass aroma tube. Next, slide your glass tube into the heating chamber and boom, you’re ready to vaporize. Once your herb is loaded you can take advantage of the Arizer Air II’s precise temperature control by using the up and down buttons on the front of the unit. The screen displays your temperature situation, and you can choose between Celsius and Fahrenheit by clicking the menu button and following the simple settings from there. This vaporizer will automatically begin heating to the last preset temperature when turned on, so you won’t have to jog your brain for what temp brings out the best in your herb. The Arizer Air II will heat to your chosen temperature in about 90 seconds. Once it’s heated it can accommodate any draw style you feel like using that day. Take a hard pull or slow and steady, the heat unit will react as needed to keep your vapor tasty. The Air II’s wide open airflow should be enough for just about anyone but, if you still want more, packing a little less herb and lifting the stem a touch off the bottom of the oven after you insert it can help open the airflow up a little bit more. Once you’ve used your Air II a few times it would be wise to give it a clean, just to ensure your sessions are getting the full flavor profile they deserve. To clean your vape all you’ll need is some isopropyl alcohol, cotton swabs, and hot soapy water. Even though your herbs are loaded into the stem, the oven itself will start to accumulate a little bit of vaped product over time so it’s best to start there. Dip a cotton swab in the isopropyl alcohol, pinch it do remove any excess liquid, flip your Arizer II upside down to protect the heating element from any liquid, and give the oven a swab. Let it dry and then do a burn-off, like the one you do before your first vape session. While your Arizer Air II oven is drying you can tackle cleaning the mouthpiece. Unscrew the black mouthpiece off of the glass stem, and make sure to keep an eye on the gasket that’s inside as it can be easy to lose. Scrub the plastic with hot, soapy water, and then leave it to soak for a bit. If you prefer to rinse in isopropyl alcohol you can do that, but don’t leave it enclosed inside the stem for more than a minute before rinsing it well in hot water. Leave the mouthpiece out to dry while you work on cleaning the stems. The easiest part of the Arizer Air II to clean is the stems. All you have to do is soak them in isopropyl alcohol for an hour or two, then rinse them in hot water until they’re clean. You can shake them out, or let them soak overnight to get a deeper clean. If you’re using a screen in the stem pop it out and throw it in the isopropyl alcohol as well. Make sure everything is dry before you reassemble, and you now have a clean Arizer Air II. To make your life easier brush out all of your vaporized herbs from the stem and oven, while it is still warm. This will keep your Air II cleaner for way longer, saving you from deep cleaning sessions and allowing your unit to last longer as whole. Truly Amazing Well done Arizer! covering defects in materials or workmanship, excluding battery. Warranty does not cover glass.